Wilhelm Conrad Rontgen (27 March 1845 - 10 February 1923) was a German physicist, of the University of Wurzburg, who on 8 November 1895 first produced electromagnetic radiation in wavelengths now known as X-rays. For this discovery, he was awarded the very first Nobel Prize in Physics in 1901. A. Kopff discovered asteroid #595 Polyxena; and M. Wolf discovered asteroid #594 Mireille. G. Neujmin discovered asteroid #825 Tanina; and S. Belyavskij discovered asteroid #850 Altona. B. Jekhovsky discovered asteroid #976 Benjamina; and J. Palisa discovered asteroid #975 Perseverantia. Yuri Alekseyevich Gagarin (9 March 1934 - 27 March 1968) was a Soviet cosmonaut who became the first human to travel into space on 12 April 1961. Launched from the Baikonur Cosmodrome, he orbited the Earth once before returning to the ground. After the flight, Gagarin became an instant worldwide celebrity, touring widely to promote the Soviet achievement. In 1967, he was also selected as the backup pilot for the first Soyuz launch. Gagarin and his instructor were killed in a crash of a MiG-15 on a routine training flight near Moscow. The cause of the crash is uncertain, but a 1968 inquest suggested that turbulence from an Su-15 using afterburners may have caused the MiG to go out of control. Weather conditions were also poor, which probably contributed to the inability of Gagarin and the instructor to correct before they crashed. The USSR launched Mars 1969B which experienced an engine explosion at liftoff and crashed approximately 41 seconds later. This Soviet Mars mission was never officially announced but has since been identified as a planned orbiter. It was launched 27 March 1969. The first stage of the Proton launcher failed almost immediately: At 0.02 seconds after liftoff, one of the six 11D43 first stage rockets exploded. The control system initially compensated for the lost engine and the launch proceeded on 5 engines until 25 seconds after liftoff at approximately 1 km altitude the rocket began to tip over to a horizontal position. The five remaining engines shut down and the rocket impacted and exploded 41 seconds after liftoff approximately 3 km from the launch pad. The nominal mission plan was to use the first three stages of the Proton booster and the Block-D upper stage to place the spacecraft into an Earth parking orbit. The upper stage would then be reignited after one orbit to begin the escape sequence. The spacecraft main engine would then be used for the final boost to put the spacecraft into its Mars trajectory. The main engine would also be used for two trajectory correction maneuvers during the 6 month cruise to Mars. The main engine would then be used to put the spacecraft into a 1700x34,000 km capture orbit around Mars with an inclination of 40 degrees and a period of 24 hours. Photography and other experiments would take place from this orbit. Then the periapsis would be lowered to 500 to 700 km for a nominal three month session of imaging and data collection from orbit. 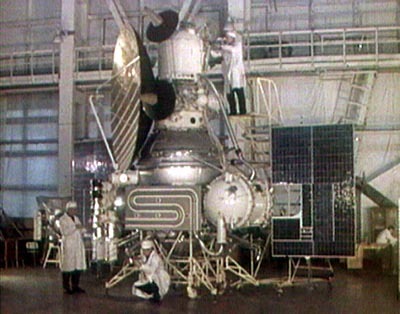 The USSR launched Mars 1969A which experienced an engine fire and explosion approximately 7 minutes after liftoff. The Soviet Mars 1969A mission was never officially announced but has since been identified as a planned orbiter. It was launched 27 March 1969. After successful operation of the first two stages, the third stage of the Proton launcher experienced a malfunction in a rotor bearing which caused the turbopump to catch fire. The engine shut down 438.66 seconds after launch and exploded, the remains of the craft landed in the Altai mountains. This mission was one of two identical probes launched in the spring of 1969. The payload was an M-69 class probe (#521), built around a spherical propellant compartment with an inner baffle to separate it into two isolated partitions. Two solar panel wings with a total surface area of 7 square meters were mounted on either side of the compartment. A 2.8 m diameter parabolic dish antenna was mounted near the top of the probe, along with three pressurized compartments, the top compartment holding electronics, the second the radio and navigation systems, and the third cameras, a battery, and telemetry devices. Also mounted on the outside of the spacecraft were two conical antennas and a suite of scientific sensors. The main engine was mounted at the bottom of the probe and used a turbopump run on the nitrogen tetroxide and unsymmetrical dimethyl hydrazine (UDMH) contained in the main propellant compartment. Eight thrusters with their own fuel tanks and 9 helium pressurization tanks controlled pitch (2 thrusters), yaw (2), and roll (4). Three-axis stabilization and orientation were achieved using 2 Sun sensors, 2 Earth sensors, 2 Mars sensors, a Canopus sensor, gyros, and small thrusters using pressurized nitrogen gas stored in ten tanks. Power at 12 amps was supplied by the solar panels and used to run the spacecraft directly and charge a hermetically sealed cadmium-nickel 110 amp-hour storage battery. Communications were via two transmitters in the centimeter band (6 GHz) which operated at [reportedly] 25,000 W and transmitted at 6000 bits/s and two transmitters and three receivers in the decimeter band (790-940 MHz) at 100 W and 128 bits/s and a 500 channel telemetry system. The parabolic dish was a directional high-gain antenna for use as the spacecraft neared Mars and the low-gain conical antennas were semi-directional. Thermal control was achieved through passive screen-vacuum insulation and through an active system in the pressurized compartments which consisted of a ventilation and air circulation unit which could run through radiators exposed to sunlight or in shadow. The spacecraft scientific payload consisted primarily of three television cameras designed to image the surface of Mars. The cameras had three color filters and two lenses, a 50-mm lens with a nominal field of view of 1500x1500 km and a 350-mm lens which had a field of 100x100 km. An image was 1024x1024 pixels for a maximum resolution of 200 to 500 meters. The camera system consisted of film, a processing unit, an exposure unit, and a data encoder to prepare the images for transmission. The camera could store 160 images. The spacecraft also carried a radiometer, water vapor detector, ultraviolet and infrared spectrometers, a radiation detector, gamma spectrometer, hydrogen/helium mass spectrometer, solar plasma spectrometer, and a low-energy ion spectrometer. NASA launched Mariner 7 for a Mars flyby. Mariner 7 was launched on a direct-ascent trajectory to Mars from Cape Kennedy Launch Complex 36A on an Atlas SLV-3C/Centaur (AC19, spacecraft 69-4) on 27 March 1969. On 8 April 1969 a midcourse correction was made by firing the hydrazine moter for 7.6 seconds. On 8 May Mariner 7 was put on gyro control to avoid attitude control problems which were affecting Mariner 6. On 31 July telemetry from Mariner 7 was suddenly lost and the spacecraft was commanded to switch to the low-gain antenna. It was later successfully switched back to the high-gain antenna. The anomaly is believed to have been caused by leaking gases, perhaps from a battery which later failed a few days before the Mars encounter. Mariner 6 and 7 comprised a dual-spacecraft mission to Mars, the sixth and seventh missions in the Mariner series of spacecraft used for planetary exploration in the flyby mode. The primary objectives of the missions were to study the surface and atmosphere of Mars during close flybys to establish the basis for future investigations, particularly those relevant to the search for extraterrestrial life, and to demonstrate and develop technologies required for future Mars missions and other long-duration missions far from the Sun. Each spacecraft carried a wide- and narrow-angle television camera, an infrared spectroscope, an infrared radiometer, and an ultraviolet spectroscope. The spacecraft were oriented entirely to planetary data acquisition, and no data were obtained during the trip to Mars or beyond Mars. At 09:32:33 UT on 2 August 1969 Mariner 7 began the far-encounter sequence involving imaging of Mars with the narrow angle camera. Over the next 57 hours, ending about 5 hours before closest approach, 93 images of Mars were taken and transmitted. The spacecraft was then reprogrammed as a result of analysis of Mariner 6 images. The new sequence called for the spacecraft to go further south than originally planned, take more near-encounter pictures, and collect more scientific data on the lighted side of Mars. Data from the dark side of Mars were to be transmitted directly back to Earth but there would be no room on the digital recorder for backup due to the added dayside data. At closest approach, 0500:49 UT on 5 August, Mariner 7 was 3430 km (2130 miles) above the Martian surface. Over this period, 33 near-encounter images were taken. About 19 minutes after the flyby, the spacecraft went behind Mars and emerged roughly 30 minutes later. X-band occultation data were taken during the entrance and exit phases. Science and imaging data were played back and transmitted over the next few days. The spacecraft was then returned to cruise mode which included engineering and communications tests, star photography TV tests, and UV scans of the Milky Way and an area containing comet 1969-B. Periodic tracking of the spacecraft in its heliocentric orbit was also done. The total data return for Mariners 6 and 7 was 800 million bits. Mariner 6 returned 49 far encounter and 26 near encounter images of Mars, and Mariner 7 returned 93 far and 33 near encounter images. Close-ups from the near encounter phases covered 20% of the surface. The spacecraft instruments measured UV and IR emissions and radio refractivity of the Martian atmosphere. Images showed the surface of Mars to be very different from that of the Moon, in some contrast to the results from Mariner 4. The south polar cap was identified as being composed predominantly of carbon dioxide. Atmospheric surface pressure was estimated at between 6 and 7 mb. Radio science refined estimates of the mass, radius and shape of Mars. 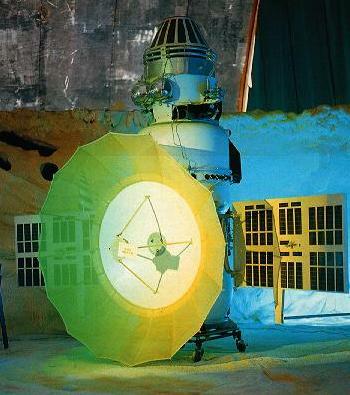 The USSR launched the Venera 8 atmospheric probe and lander to Venus. L. Zhuravleva discovered asteroid #2562. USSR lost contact with the Phobos 2 probe in orbit about Mars shortly before its final mission phase, during which it was to approach within 50 meters of the surface of Phobos and release two landers, a problem traced to an onboard computer malfunction. NASA'S X-43 set an air-breathing vehicle speed record in the first free flight of a supersonic combustion ramjet. NASA's second X-43A hypersonic research aircraft flew successfully on 27 March 2004, the first time an air-breathing scramjet powered aircraft has flown freely. The unpiloted vehicle's supersonic combustion ramjet, or scramjet, ignited as planned and operated for the duration of its hydrogen fuel supply. The X-43A reached its test speed of Mach 7, or seven times the speed of sound. The flight originated from NASA's Dryden Flight Research Center at Edwards Air Force Base, Calif. Taking off at 12:40 p.m. PST, NASA's B-52B launch aircraft carried the X-43A, which was mounted on a modified Pegasus booster rocket. The booster was launched from the B-52B just before 2 p.m. PST. The rocket boosted the X-43A up to its test altitude of about 95,000 ft. over the Pacific Ocean, where the X-43A separated from the booster and flew freely for several minutes. During the free flight, the scramjet engine operated for about 10 seconds. The thirty-second recorded perihelion passage of Halley's Comet will occur.